I was supposed to do cross training with Kyle today but the timing didn’t work out. I did a short workout on my own. Everything except for the treadmill walk was repeated 3x. The other day I had waffles for dinner. I lovvve waffles. I could eat them for breakfast, lunch, or dinner. However, I tend to not order them when eating at a restaurant because they are usually made from all-purpose flour and a lot of oil/butter. And actually, now that I think about it, I really don’t eat waffles very often (maybe 1x/month, if that). These were whole wheat organic waffles. We usually buy the box mix (from Fresh and Easy). If you buy boxed as well, I highly recommend that you look to make sure that there are NO trans fats in the ingredients. Bisquick used to have trans fats, not sure if this has changed. I talked about trans fats briefly in this post, but I’ll repeat it again. Trans fats will read as “partially hydrogenated” oil (hydrogenated oil is saturated fat) in the ingredients section. You have to read the ingredients section because the box can get away with writing “0 grams trans fats” if it’s under 0.5g/serving. So I know waffles aren’t the healthiest meal. 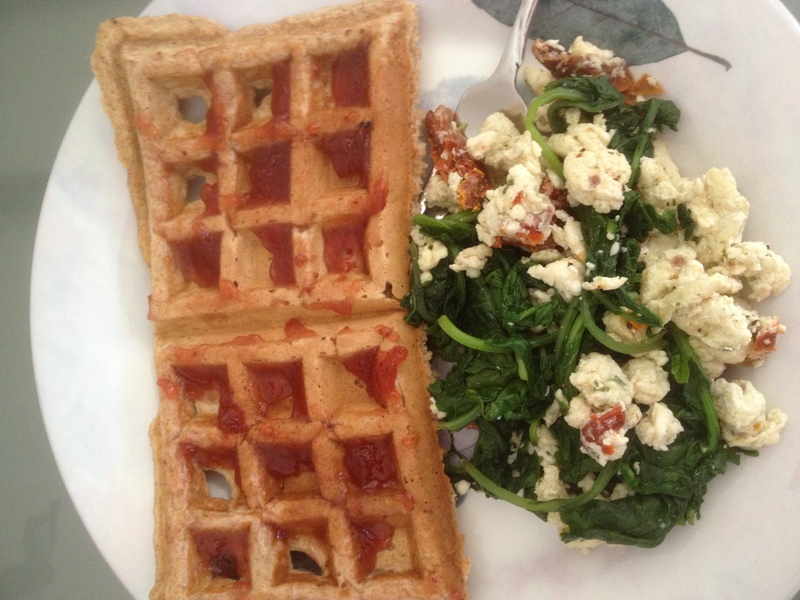 I have made protein waffles in the past that were actually quite nutritious. However, I generally don’t crave those, so I had to come up with a healthier way to eat regular, from box mixes, waffles. I believe in eating in moderation. If you eat healthy 95% of the time, allow yourself a treat once in a while. NOTE: Pancake/waffle mixes will differ in the ingredients (and amounts) that need to be added. This is a guideline that you can use for other mixes. Pancake mix– no changes here. I really prefer to use whole wheat mix. All-purpose flour (most regular mixes) really has no nutritional value. Multi-grain is better than all-purpose flour, but whole wheat is the best out of all 3. Milk– I use unsweetened almond milk or fat-free milk. You aren’t drinking this liquid straight from a glass, so you don’t taste a difference if it has no fat or added sugar. Egg– You can switch this to egg whites only if you would like. I have done this in the past if I have a carton of egg whites. I know people are concerned with cholesterol in the yolk, however, if you don’t have high cholesterol there are some benefits to the yolk. Egg yolks contain choline, carotenoids, and many vitamins and minerals. Remember, it is only 1 egg in this recipe, not 10. Oil or butter– I never use butter for this recipe. Instead, I add 1 tbsp coconut oil or grapeseed oil to a measuring cup and then add “no sugar added” applesauce to bring it up to 1/3 cup. I find that you don’t really need that much oil to make good waffles. Almond Extract– My secret ingredient is almond extract. I lovvvve to add a splash to my waffles and I think it really gives it good flavor. If you don’t like almond extract, play around and add different kinds: vanilla, orange, strawberry, etc. I think they would all taste good. Remember these are strong extracts so don’t add a ton. Also, I add all-natural extracts, NOT imitation. I like to top with fruit spread, which is basically jam without the added sugar (naturally sweetened with fruit juice), OR maple syrup. When I say maple syrup I mean natural maple syrup, as in it should only say maple syrup in the ingredients section. A lot of “maple syrups” are fake and just processed sugar/corn syrup. An easy trick to tell the difference other than reading the ingredients section- real maple syrup will need to be refrigerated after opening. The fake stuff usually crystallizes/hardens upon refrigeration. But seriously, check the ingredients. And there you have it! Like I said, I believe in moderation, not deprivation. I’ll share more of my healthier substitutions later. Enjoy! Previous Post Dealing with a crappy run.